The performance is in English, with professional actors from Athens directed by the stage director Lefteris Giovanidis. The venue (KDEPPAM) is a 100 years old historic building, easy to find, in the center of the city of Mykonos . Mykonos acquires permanent theater scene this summer, with the initiative of KDEPPAM and under the auspices of the Municipality and Ministry of Tourism. 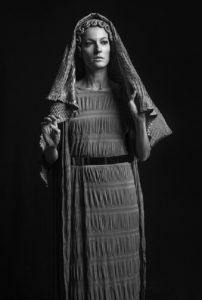 It presents “Antigone” by Sophocles regarded as the most complete of the surviving ancient Greek tragedies. 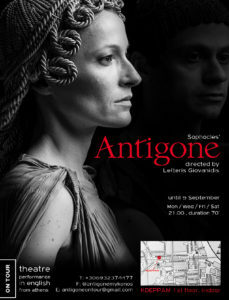 It’s a great opportunity and an important experience for our country’s visitors to see the classical drama of “Antigone” and to meet a part of our culture. Except from the booked performances, every MONDAY – WEDNESDAY – FRIDAY and SATURDAY at 9:00 p.m. we are going to have an extra performance, for everyone on the island who wishes to see it. The theatre is indoors, it can seat up to 120 people at a time and it is fully air-conditioned. He had born in Athens in 1974. He had studied stage directing in New York. He had directed 30 plays. Except from Athens he had worked as a director also in Italy, Croatia, USA and UK. He had translated more than 15 plays in Greek and he had also adapted 5 books to plays. He had worked also as a theatre producer. He directed the metal ceremonies for the Olympic Games ATHENS 2004, and also other athletics ceremonies and events. The last four years he lives and works between Athens and New York.